Making Success Tangible for All Students – Lead. Learn. Grow. I’ve been doing a lot of reflecting on my practice, leadership, and goals. In all those things, my greatest desire is that it’s less about me and more about others – mainly my teachers, students, and their families. In our age of testing and accountability, the pressure to produce higher test results is real. But what are we doing to ensure that our students are better equipped to face the world? Do our practices inspire students to greatness – so that they can be the innovators of the future? All of our students deserve to see themselves as capable and successful. If we are not intentional in our practice and strategic in our methods, we have the opportunity to either build that within them or tear it down. Here are a few questions on my mind that may be helpful as we all work on the work of making our students and schools better. 1. Recognition. In what ways do you recognize student growth and success in your school or classroom? Who is being recognized and for what? Are your celebrations connected to your intended goals and outcomes? 2. Practice. Are you holding on to practices or traditions that may unintentionally disenfranchise students or that don’t position all students for success? 3. Message. Do your words and actions send the message that you believe that all students are capable of success? 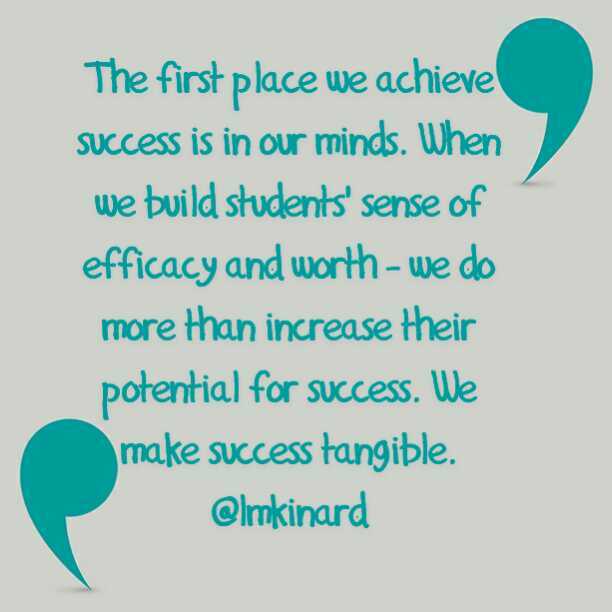 Let’s be intentional and deliberate about making success tangible for our students.